Where do I use my Prestige Flowers voucher code? Select a deal and follow the link to the Prestige Flowers website. When you’ve finished shopping, head to the checkout and enter the recipient’s name and delivery address. Enter your billing address. You will also need to choose a password for your online account. Proceed to the payment window and enter your payment details. Once you’ve entered your card information, confirm your payment. Prestige Flowers offer exactly what their name says; luxury flowers for all occasions that you or your lucky recipient will love. With flowers for all occasions including birthdays, mother's day, funerals, valentines day, Christmas and much more, you're sure to find a gorgeous bouquet to celebrate someone in your life at Prestige Flowers. If you're shopping on a budget, you can always check out the offers section where you'll find tons of discounted products and price reductions on all manner of flowers and gifts. Looking for a beautiful bouquet, then look no further than Prestige Flowers - on site you will find a vast selection of different bouquets to suit everyone. You can choose from Roses, Lilies, Gerberas, Tulips to name just a few of the fabulous flowers available and as you can imagine the colours on offer would be fitting for any occasion - whether it's a Birthday Flower arrangement, Mother's Day Flowers, Christmas Flowers or Sympathy and Funeral Flowers - Prestige Flowers really do stock the right bouquet for the right occasion. If you are unsure which type of bouquet would be best they categorise them into the main occasions people would buy for offering inspiration and guidance. You can also add that extra special gift to your order such as Chocolates or Balloons plus they also stock a wide range of Hampers too - just in case you are looking for something a little different to Flowers. Don't forget to check for prestige flowers free delivery codes, meaning you save money on the postage cost. 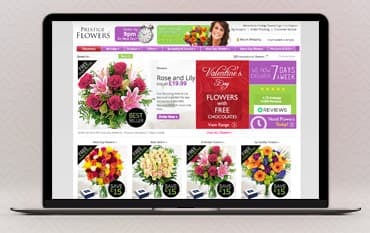 Once you have placed your order online with Prestige Flowers, whether it's for Flowers or a Hamper - you are able to easily track where your order is with the prestige flowers tracking system. It is so simple to use - all you need is your Email Address and Order Number, just visit the 'Order Tracking' section on the Prestige Flowers website, enter your details and you can track your order, giving you peace of mind that your delivery is on track to be delivered on time. Looking for Flowers in a hurry? No problem... Prestige Flowers offer a Next Day Flower Delivery Service of selected Flowers By Post Arrangements. Order by 9 pm the day before, 7 days a week, and you can opt for your order to be delivered the following day by one of the couriers that boast a 5-star service. There is even free delivery on selected bouquets plus each one will include a free box of chocolates - another reason for the recipient to have a smile on their face... All arrangements are backed by a 100% Satisfaction Guarantee - offering another reason why Prestige Flowers should be your one-stop shop for next day flowers. Prestige Flowers pride themselves on aiming for complete customer satisfaction. letting you send carefully arranged gorgeous flowers throughout the UK with next day flower delivery and a 100% satisfaction guarantee. Prestige Flowers offer beautiful bouquets for all occasions, including birthday flowers, romantic flowers, anniversary flowers, thank you flowers, new baby flowers, sympathy flowers and much more. Send a gorgeous bouquet for less by using one of the Prestige Flowers voucher codes listed here.